A huge thanks to http://simraces.com for hosting this series. Dead Meat Gamers will be giving $10 PayPal to the 250 and 450 class champions. - Top 40 qualify straight into the heat races. - One 15 lap main event. - A warning will be given for first time offenders of small violations. Warnings can also be given out in bulk to several riders at once. - A second time offender, or a rider who commits a major violation as their first offense will be suspended for one round. - A third time offender will be suspended 2-5 rounds based on the severity of the violation. - A fourth time offender will be suspended from simraces.com permanently. - Holding up a leader for 1-2 corners. - Attacking other riders in the race thread. - Cutting the track and gaining an advantage over other riders. - Purposely taking out riders. - Taking out a leader by being careless. - Purposely taking out leaders while being lapped. - Purposely holding up the a leader for 3+ corners. - Cross jumping a leader. - Going backwards on the track into traffic. - To protest you must PM an admin no later than the Sunday following the race. - You must include a detailed description of the incident and a GIF of the incident. - We are more interested in protests about major violations. So keep that in mind when filing protests. For example: If a rider holds you up for 2 corners while you are lapping him, there will probably be no penalty, just a warning. We should be able to catch most minor violations while reviewing the demo's ourselves after the races. 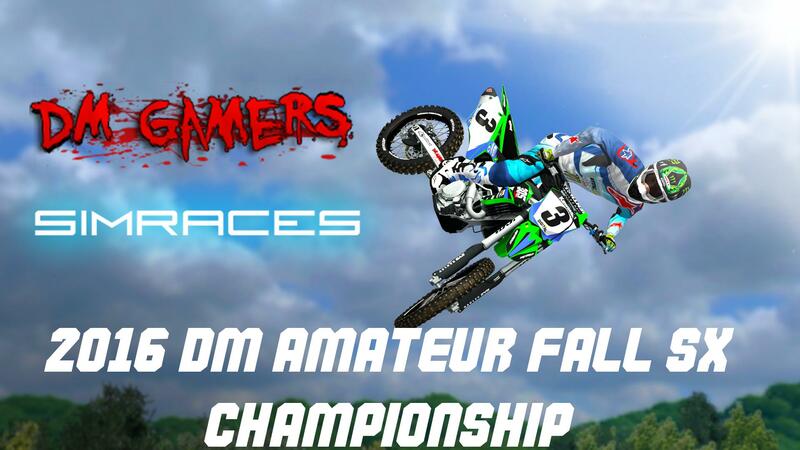 - Any rider who has not scored pro rF/EMF points can race this class. - If you are a previous champion of this class you may defend your #1 plate one time, but after your defending season you are no longer eligible for this class. The defending open class champion must race this class if they attend our series. - We have reserved numbers 1-50 for riders based on how they did in our last championship. These are reserved, not required. Meaning that while the number is there for you to run, you are not required to. If you did not earn a number for this series, you must run 51-999. - If you are a previous champion of this class you must move up to the 450 class.